The prestigious Catholic University of Leuven in Belgium has announced its withdrawal from a controversial EU-funded research cooperation project with the Israeli police and the Israeli Ministry of Public Security. 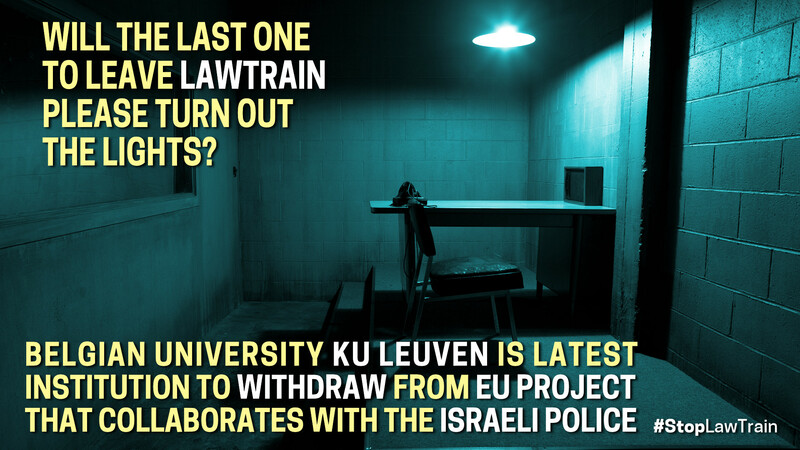 December 11, 2017 — The Catholic University of Leuven in Belgium has announced its withdrawal from a controversial EU-funded research cooperation project with the Israeli police and the Israeli Ministry of Public Security. The decision comes as EU Foreign Ministers meet this morning with Israeli Prime Minister Benjamin Netanyahu, who is struggling to contain Israel’s growing international isolation as a result of the Boycott, Divestment and Sanctions (BDS) movement. For months, advocates for human rights — Palestinian and European civil society, academics, artists and MEPs — have been questioning the research project for common prisoner interrogation techniques with two Israeli entities that are complicit in the torture of Palestinian prisoners, including children, in violation of international law. LAW TRAIN, as the project is known, is financed by the European Union under the framework of Horizon2020, the Union’s research fund. We are happy that the rector of our university has decided not to prolong this collaboration with the Israeli police on research. We had hoped for an immediate pull-out, but that was admittedly not an easy step. We also fully endorse the rector’s proposal to draft a human rights charter that will monitor our research and hopefully avoid similar missteps in the future. The withdrawal of the Catholic University of Leuven from LAW TRAIN follows the Portuguese Justice Ministry’s withdrawal of support in response to pressure back in July 2016, in a move that was seen as a major boost in the campaign to stop the project. This latest decision puts in question the continuation of the controversial project. Another core partner in LAW TRAIN has taken the only ethical decision possible and left the project for as long as Israeli institutions complicit in Israel’s violations of Palestinian rights are involved in it. LAW TRAIN not only disregards Palestinians human rights, it normalizes them, giving Israel a green light to continue its torture methods. Even worse, LAW TRAIN exhibits them as an example to follow in Europe. This second withdrawal from LAW TRAIN may spell the end of the project. Until then, we continue to call on the European Union and all remaining participants to follow the example of Portugal and the Catholic University of Leuven and withdraw support from this ethically and legally reprehensible project. The dean of the Catholic University of Leuven, Luc Sels, acknowledged in a statement published on the 6th of December that the institution will stop participation in LAW TRAIN beyond April 2018, when the current funding cycle ends. He argued that the project "poses an ethical problem in view of the role played by this strong arm of the Israeli government in imposing an illegal occupation of the Palestinian territories and of the oppression it causes for the Palestinian population." The Belgian Stop LAW TRAIN Coalition is now demanding that the Belgian government follow suit and also withdraw from the project. The campaign across Europe continues, led by the European Coordination of Committees and Associations for Palestine (ECCP), calling on the EU to respect its own laws by banning Israeli military and security companies from participating in EU research and from receiving EU funding. The Israeli Ministry of Public Security, which includes the Israeli police, is responsible for illegal detention practices, routine torture, and violence against Palestinian protesters, policies that have been condemned by the UN and human rights organizations. The Ministry plays an active role in the illegal detention of thousands of Palestinian political prisoners in Israeli jails. The presence of the headquarters of the Israeli National Police on occupied Palestinian territory in East Jerusalem constitutes a serious violation of international law. Over 750 Belgian academics and artists have called on the members of the project to withdraw while the EU Commission is yet to respond to Members of the European Parliament (MEPs) on a legal opinion signed by 25 renowned legal experts questioning the legality of its funding to Israeli entities.